"European Construction Systems" LLP (ООО “Европейские Строительные Системы”) was founded in 2007 as one of the “EUROPACK” company’s subsidiaries. We offer a new product on the Russian, Ukranian, Polish and Baltic States' market. 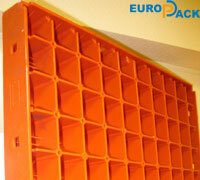 You are welcome to get acquainted with more than 100 times reusable plastic formwork system. The company's basic activities are as follows- formwork construction engineering, detailed specification preparing, plastic formwork trade, monolith construction audit. Integrated approach for building process preparation allows our clients to get all the necessary formwork equipment and detailed design documentation. Our company's main value is highly professional staff. At the moment our personnel department lists up to 30 workers in Russia, Ukraine and Baltic States. The talent and common efforts of our managers’ and engineers’ team ensure the success of “European Construction Systems” LLP. Plastic formwork systems: EH, EE series are new word in monolith building. It helps to make building process easier. Our offered formwork systems satisfy all the requirements not only for product quality, but for building quality, too. On 9th -12th of April, 2008 EUROPACK LLP company took part in international building exhibition RESTA 2008 in Klaipeda, Lithuania. From the first day of the exhibition our production has turned local building companies’ interest. In the second half of the year 2007 in Mariupol (Ukraine) we have built the warehouse for our offered products storage by ourselves. 9/11 korp.2 Dmitry Uljanova Str.